Cette belle maison Cap a tous les équipements modernes avec air climatisé central, immense terrasse, meubles de patio, 50 'TV plasma avec son surround, 2 cuisines, 2 salons, 4 chambres, 3 salles de bains douche extérieure, laveuse et sécheuse, marcher jusqu'à la plage , rue calme avec beaucoup d'intimité. La région a de bons restaurants et magasins. Piste cyclable est une grande attraction et est un mile de distance, la plage la plus populaire à Falmouth là-bas avec salles de bains et un snack-bar. Photos do not do this property justice. It is beautiful. All top of the line appliances, plenty of room for entertaining indoors or out. Spectacular deck. 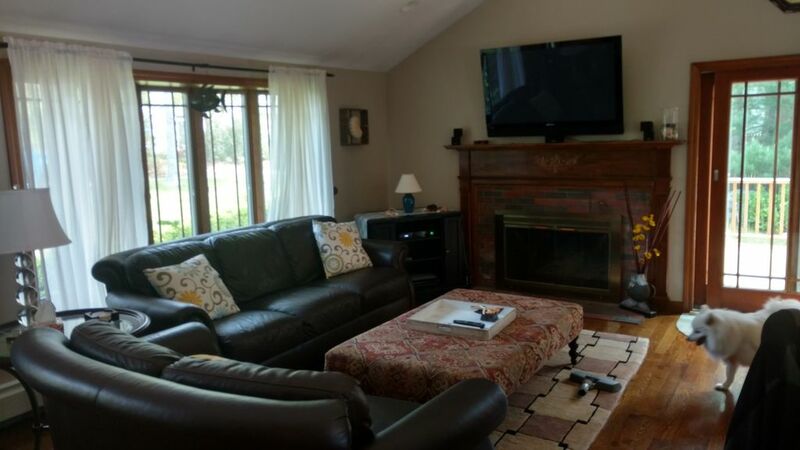 Located in a lovely, quiet neighborhood, close to Old Silver Beach and West Falmouth Harbor. Less than a mile to walk to Old Silver Beach. Easy walk down a side street. House itself looks decent from the outside but is beautiful on the inside—lots of updates, spacious bedrooms, amazing master suite, and two full kitchens! We spent 2 weeks in West Falmouth and had a wonderful stay at this property. The house was clean and very comfortable. The central A/C was great to have during the hot and humid weather, and we all loved the outdoor shower. We are looking forward to our vacation there next summer! Pictures don't do it justice. Awesome location in perfect West Falmouth location. Clean and nice decor. Great rental, very clean and on a nice quiet street. We could walk to the beach, also short drive to woods hole ferry. Nice big deck off kitchen, and nice outdoor shower. Love this rental, we will definitely come back. The house was spotless when we arrived and had everything we needed for the week. The pictures don't do the house justice! Falmouth has so much to offer and Old Silver beach is one of the nicest on the Cape. The owner answered all calls and texts promoptly. Would recommend this house without hesitation! !